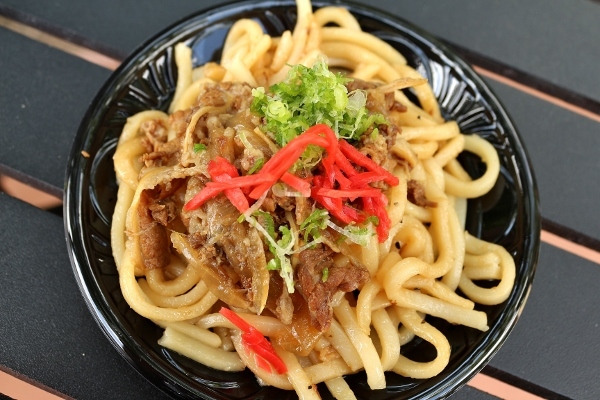 One of my absolute favorite dishes from last year's Epcot International Flower and Garden Festival was the Beef Teriyaki Udon from the Hanami outdoor kitchen in the Japan Pavilion. It's a dish that my sister and I regretted having to share with each other, and wished we had order two plates instead of one. It was phenomenal! I was absolutely thrilled to find a recipe for this dish in The Best of Epcot Festivals Cookbook, which I purchased last December at Epcot. I'm sure this recipe is slightly altered for home cooks, but it's still pretty close to what we enjoyed at the festival. Here are some notes from my experience making these noodles. 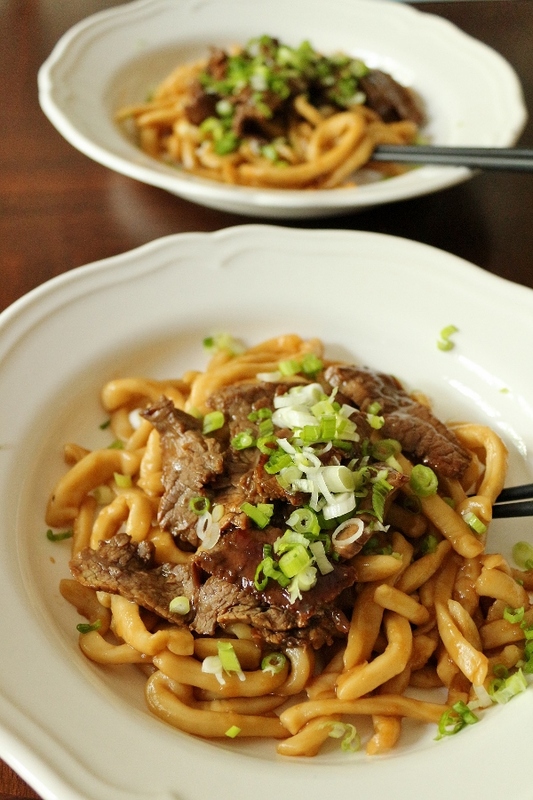 The recipe calls for 8 ounces udon noodles to 1 pound of flank steak, which seems very off to me. 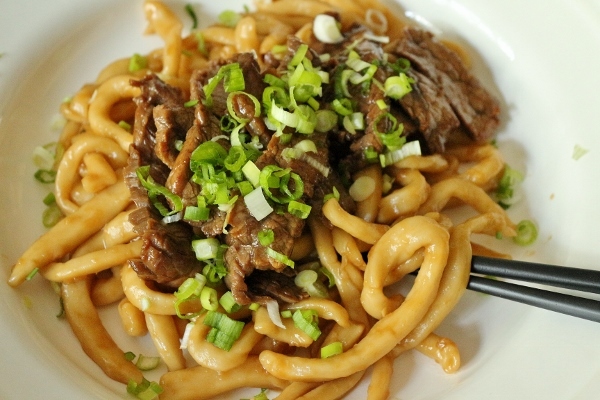 I followed my gut, and used an entire pound of homemade udon noodles, and the result was a perfect balance of noodles to beef. Any less, and the majority of the dish would have been beef, which was certainly not what was served at the festival. I've made the change in the recipe below. I sliced my flank steak into 1/4-inch thick slices, but the pieces were rather large and flat, and in retrospect it seems the recipe suggested cutting into 1/4-inch-wide strips, like matchsticks instead of flat slices, although it wasn't very clear. I would cut the pieces thinner/smaller next time to be more like the original dish which felt almost like shaved beef. It was still excellent prepared this way, just a bit different from what we ate at Epcot. The original version also appears to have sauteed onion in the beef mixture, which is missing from this recipe provided by Disney. Honestly, you could easily saute some thinly sliced onion with the beef if you'd like, but this recipe was delicious exactly as is. Whether it's completely authentic to the Flower and Garden Festival version or not, I'm still very happy with the delicious result! 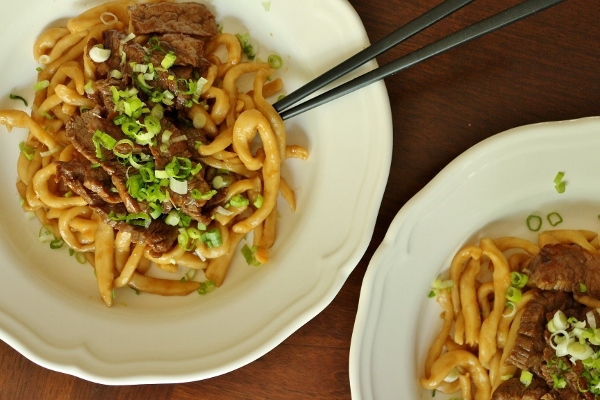 You really don't need the extra sauce for drizzling at the end, and just to avoid being wasteful I may scale back the sauce/marinade the next time I make these noodles (there will definitely be a next time!). I used homemade udon noodles I had prepared months ago and frozen, so mine were perhaps a bit thicker than a store-bought variety, but half the fun of my noodles is that they are kneaded by foot (oh yes, just like the Japanese do) and hand-cut :) Whether yours or homemade or not, this recipe is excellent and worth a try whether you are an avid Disney fan, or simply a lover of Japanese cuisine. Combine teriyaki sauce, 1/2 cup soy sauce, mirin, water and sugar in a medium saucepan over medium-high heat, stirring until ingredients dissolve. Bring to boil then reduce heat to low. Place cornstarch in small bowl and whisk in 2 to 3 tablespoons of the simmering sauce. Add back to saucepan and whisk until mixture thickens, about 3 minutes. Remove from heat. 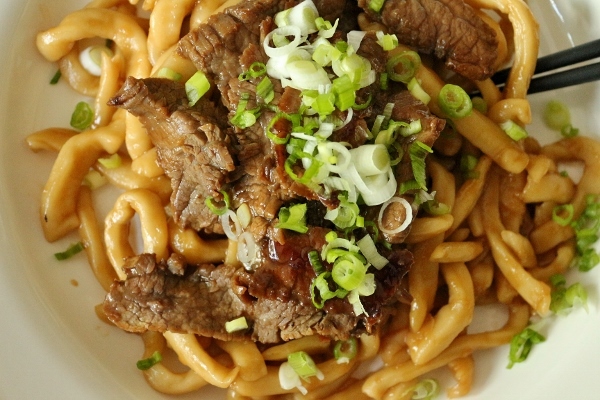 Place beef and 2/3 cup of sauce in a large bowl, mixing until beef is thoroughly covered. Refrigerate for 30 minutes. Keep remaining sauce warm until ready to serve. Meanwhile, cook noodles according to package directions, shortening cooking time by 2 to 3 minutes so that noodles are al dente. Remove from heat, drain and toss with canola oil. Set aside. Strain excess marinade from beef, and cook beef in large skillet or wok over medium heat until browned, about 2 minutes per side. Remove from skillet, place on plate and cover with foil until ready to serve. 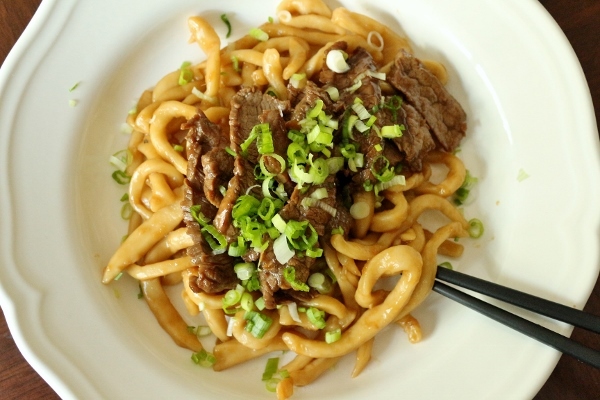 Mix together remaining 1/4 cup soy sauce, ginger and rice wine vinegar in skillet or wok large enough to hold the noodles. Cook over high heat until boiling, reduce heat to medium and add cooked noodles, heating through until sauce thickens and coats the noodles. 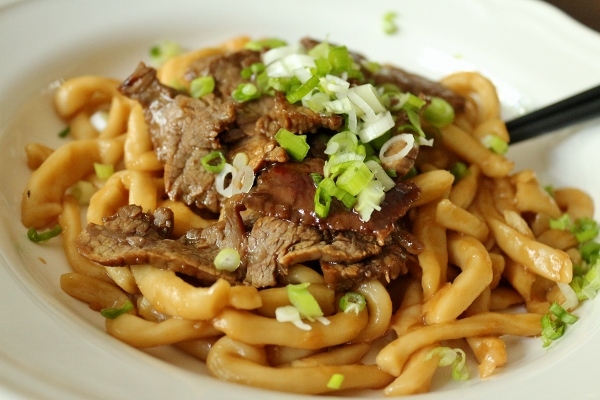 To serve, place hot noodles on plate and top with beef. Garnish with onions and pickled ginger, and serve with remaining sauce on the side for drizzling.